Toby Jones Fishing: Look out swimmers...! 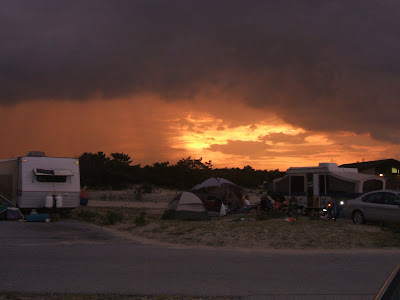 I was lucky enough to spend Tuesday and Wednesday of this past week with my good friends Zack and Jenny and their family at Assateague Island State Park, in Maryland. Zack and Jenny had been on the beach since the previous Friday and had been fishing hard without much luck, so hopes were not extremely high as far as catching. Still, with Hurricane Bill churning in the Atlantic we hoped some of the effects of the storm might change things up for the better. 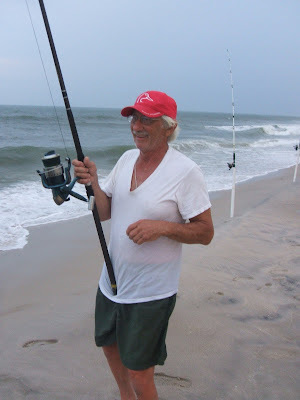 I arrived Tuesday afternoon, and we fished that evening and into the night without a bite. The next day we got started in the morning, but were unfortunately told to leave the beach because of an oncoming storm, which never mat erialized. 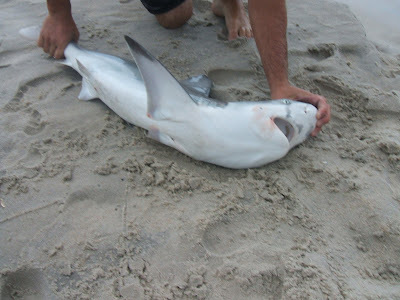 Luckily, after we returned to the beach in the afternoon a couple of sharks decided to come inshore to play. First off was Matt, a friend of Zack's from Johnstown area. 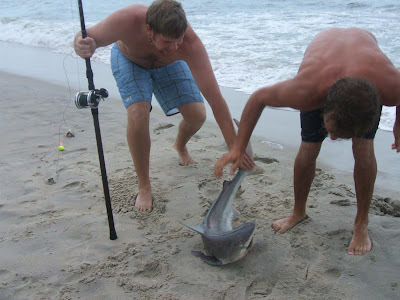 We were all lounging in our beach chairs when the tip of Matt's rod twitched ever so slightly... we all walked over to the rod, but honestly didn't expect much as the sharks we are used to catching generally hit like a freight train and this seemed more like a bait stealing skate or dogfish. 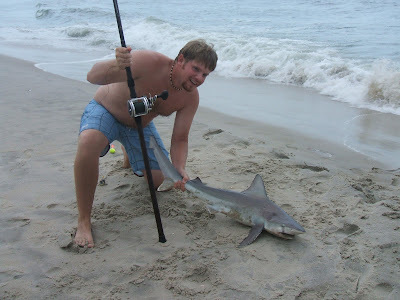 Matt picked up his rod and could feel that a fish was biting and taking some line. 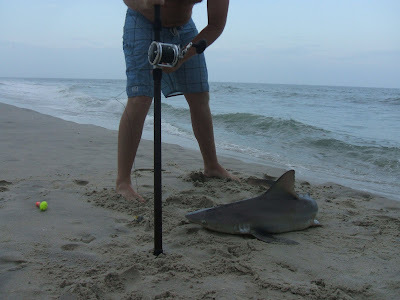 Sure enough, before long he set the hook and was into the first shark of the trip--which turned out to be a small, but sleek looking dusky shark--not a monster by any means, but still enough to draw a crowd from the resident beach goers, fearing for their limbs, lol. About an hour after Matt's catch, I had just re-baited and casted out one of our smaller bait rods when I thought I heard the faint sound of a reel clicker. I paused for a second then dismissed the thought. A moment later, ever yone was yelling and we were all racing over to my rod. The line was peeling off of my reel and I quickly tightened up the drag, turned the clicker off, and just like that was tight onto a fish. The fight turned out to be a little bit less than I was hoping for, but the angry little shark did make at least one more decent run. 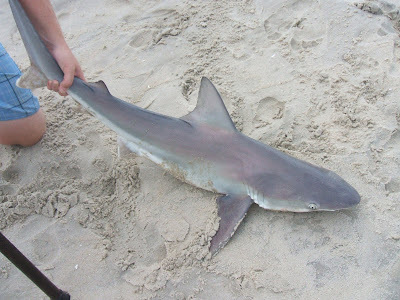 In couple of minutes I had shark number two on the beach--another small dusky nearly identical to the previous one. All in all, it was an awesome couple of days. Time flies when you are having fun and these days were no exception. 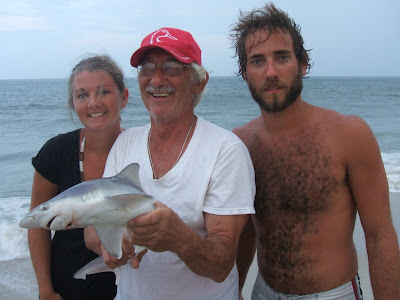 The action wasn't fast, but like always, everyone had a great time and we actually did end up catching a few sharks. I only get to see Zack and Jenny a couple times per year and it is always a joy to spend time with them. Fish or no fish it is great to spend time with good friends--but thankfully we didn't have to deal with the no fish part on this trip, lol! Thanks again Zack and Jenny for an awesome couple of days, and for sharing your campsite and hot dogs with me, ha ha. And thank you all for reading as well.